I love the Dallas of the late 60s and early 70s, before any of the "new" stuff was built that decade. Everything constructed in the 50s was starting to show its age and things just had a weathered/gritty look overall. First time that people talked about redeveloping downtown, in a modern sense, from what I gather. I had no idea downtown was still this popular in the 60s/70s. These are awesome videos. Those are fun, I wish I could walk into one of those videos and just take a look around. mdg109 wrote: I had no idea downtown was still this popular in the 60s/70s. These are awesome videos. Same here. I thought Downtown went into serve decline during that time. Tnexster wrote: Those are fun, I wish I could walk into one of those videos and just take a look around. It would be awesome (today) if we could get any large retailer to stay open until 9 pm. What is also great about that is you can see how much more open the building looked from the pedestrian level when it was a department store with the glass storefronts wrapped around the ground level with the beautiful mural above. DART really destroyed the beauty of the building in their conversion to an office building. Time will tell if some of that beauty can be restored once DART finally moves out to a better space for them. It won't be a department store again but it could be a cool building with a mixture of restoration and new use changes. Also, there are no doors at the entrance. Climate was controlled by an "air curtain" at the opening. Probably very inefficient and hard to secure, but unique. That definitely would be an experience to see Dallas as such a vibrant and lively city. Although, I feel like in a decade or so, Dallas will be just as (or even more) lively than before. One cool way of looking at it, is that this might be one of the rare times where we all get to experience parts of Dallas while they are still a bit deserted. I remember going to Deep Ellum on a Saturday night a couple years ago and the street was empty, and there were only a handful of people in some of the bars, and I also remember going to the Farmer's Market Food Hall when it just opened and it was also very barren at the time. I guess it's not really a good thing that parts of our city are so dead, but, it's kinda cool to think that 20 years from most of these sights will be jam-packed full of people but we can all remember a time when that definitely was not the case. Going through all these videos, I'm still seeing all the surface lots that exist today (check out 0:20s on that last link). It looks like all the pedestrian activity and vibrancy was concentrated on EMC & Pacific. Thanks for pointing that out. I totally forgot about that. I couldn’t imainge how much energy it took to maintain that air curtain...especially, during the summer. One thing in this video that I can't figure out is seeing the "Copper Cow" restaurant on Commerce. The video is labeled March 1974 but according to at least two stories in D Magazine, that building burned down in 1960. EDIT: Learned that the restaurant did catch fire in 1960 but reopened the same year, closing for good in 1980. Sure would be nice if the city allowed normal signage again. "Cleaning up" the appearance of downtown street, decluttering and whatever sure seemed to make sense a couple decades ago, just like cutting into the sidewalks for additional traffic lanes. I suppose for a generation or two, initiatives like that had some positive impact; mimicking the clean and safe suburban environment was the goal for many downtowns. Now it simply diminished excitement. tamtagon wrote: Sure would be nice if the city allowed normal signage again. "Cleaning up" the appearance of downtown street, decluttering and whatever sure seemed to make sense a couple decades ago, just like cutting into the sidewalks for additional traffic lanes. So, that’s what happened to all the signage. To me signage, (when appropriate) makes a downtown seem more lively. Maybe its some stock footage they mixed into the bulk of new footage from that day? The sheer number of steakhouses back then downtown is funny as well. One of the blade signs that stood out for me in that footage was the one for Piccadilly Cafeteria. In 1964 this was the site of a protest that lasted 28 days over the restaurant's refusal to desegregate its counter. I found out that it was located at 1503 Commerce St, opened in 1955 and closed in 1977. The building was home to a Scholtzky's at one point and was still standing in 2008. It was purchased by Headington and torn down for the first Joule expansion. cowboyeagle05 wrote: The sheer number of steakhouses back then downtown is funny as well. Like the sheer number of steakhouses currently in Uptown? I love signs like that, Downtown absolutely needs re-regulation so business can announce themselves like this. Call it a wayfinder if that's the kind of lingo decision makers have become conditioned to recognize. Whatever. I never knew Piccadilly was in Dallas/North Texas, not surprised by the Old South Segregationist hold-out.... I think there's still a few in The ATL, but it's been years since I've eaten at a place like that. I'll be surprised if the contemporary food court branding trend (!!! Food Hall !!!) doesn't settle down into renewed interest in delicious cafeteria food. Just came on here to post the link too! This footage is incredible and at the same time really, really depressing. Tragic how such a vibrant city was just picked apart over decades and is only now starting to show any glimpses of what's in this video. The people responsible for gutting Downtown really ought to be caught and shot. Some of those scenes look very much unchanged but there is obviously a lot missing too. Lots of nice cars tho. Wow! It’s amazing to see how many businesses were in Downtown at that time. Great post! Yeah, Downtown was a vibrant center back in those days. And it actually looked like a real city with real pedestrian activity and connectivity. No matter how developers try to rebuild, we will never be able to achieve the quality of that era. joshua.dodd wrote: Yeah, Downtown was a vibrant center back in those days. And it actually looked like a real city with real pedestrian activity and connectivity. No matter how developers try to rebuild, we will never be able to achieve the quality of that era. I think we can rebuild that if we actually followed the Forward Dallas plan and reintroduced an intra-urban streetcar network like this city was designed for (and maybe getting rid of highway 345 and shielding the other highways more). It's not that hard, but the city would have to stop kowtowing to big developers and their parking garages and we have seen that the city leader's personal pocketbooks are not willing to do that. I love looking at this footage. I wonder if the downtown activity was concentrated mainly at EMC. I'd love to see what West End, Farmers Market, Pacific, and Ross Ave looked like. I did notice some of the same surface lots we have today (Main/Griffin, Commerce/Harwood, behind City Hall). While the older downtown looks cool, I still think we have a chance to build a better downtown. I'm glad we have more parks, more residential, and we have a chance to get better retail. From the footage I see a lot of cool shops, but also jewelers, discount centers, and loan centers. If we have more independent retail and less corporate generic retail that would be great. But it seems the latter of the two is always inevitable when it comes to gentrification. ^People have been conditioned to question small, independent retailers as possibly unreliable, lower quality, lower value for the money and favor corporate retail as stable, reliable and quality driven. Maybe it's ironic, independent retailers don't survive gentrification in part because they are associated with undesirability and inability to meet certain standards by new neighborhood residents craving the familiar, the brands they know will meet expectations; these expectations are the result of conditioning rather choice. As it appears to be now, the basis of a thriving downtown have returned to Dallas. Well defined areas of intense street activity with buffered around and between areas of passive areas. mdg109 wrote: I love looking at this footage. I wonder if the downtown activity was concentrated mainly at EMC. I'd love to see what West End, Farmers Market, Pacific, and Ross Ave looked like. I did notice some of the same surface lots we have today (Main/Griffin, Commerce/Harwood, behind City Hall). While the older downtown looks cool, I still think we have a chance to build a better downtown. I'm glad we have more parks, more residential, and we have a chance to get better retail. From the footage I see a lot of cool shops, but also jewelers, discount centers, and loan centers. I've thought about this too. From early 1970s photos I've seen of Pacific Ave (the back side of the theaters in Theater Row) it was pretty barren, so I imagine everything north of here save for Republic Center, Medical Arts and Southland Center was parking lots and warehouses until you reached the churches and car dealerships on the pre-Arts District north side of downtown... not exactly a paradise of pedestrian activity. And south of Jackson St, since most of it was bulldozed for Main Center and Griffin Square, all you had was the cemetery and Memorial Auditorium so it's safe to assume that what people called downtown at the time was Elm-Main-Commerce. Side note: Spaghetti Warehouse was the first restaurant to open in the West End in 1972, so it was probably only the county buildings there, plus the "new" Kennedy Memorial, at the time of this film. Likely ten times better and less expensive. Found some old video clips of the Titche’s and Sanger-Harris stores in Downtown. Both videos show the stores in the process of being rebranded. This is the original plan for Main Place. I’m glad this project wasn’t competed. There was a plan for a mall in Downtown. Another horrible plan, which never got off the ground. I remember those mall proposals. One was adjacent to the Crescent, one was across the street from BOA Center, and the other, my favorite because of all the towers it brought, was between Akard and St. Paul at Ross. The hope was that a Downtown mall would do for Dallas what Horton Plaza did for Downtown San Diego. It's interesting to me that the Downtown mall video talks about the huge success of Reunion Tower. Is that still considered a popular attraction? I haven't been to it in a while, so was curious. dallaz wrote: Found some old video clips of the Titche’s and Sanger-Harris stores in Downtown. Both videos show the stores in the process of being rebranded. Things were grim for downtown retail at that time. We're lucky Neiman Marcus didn't abandon their flagship store. I don't remember this being posted before, but it's gold. 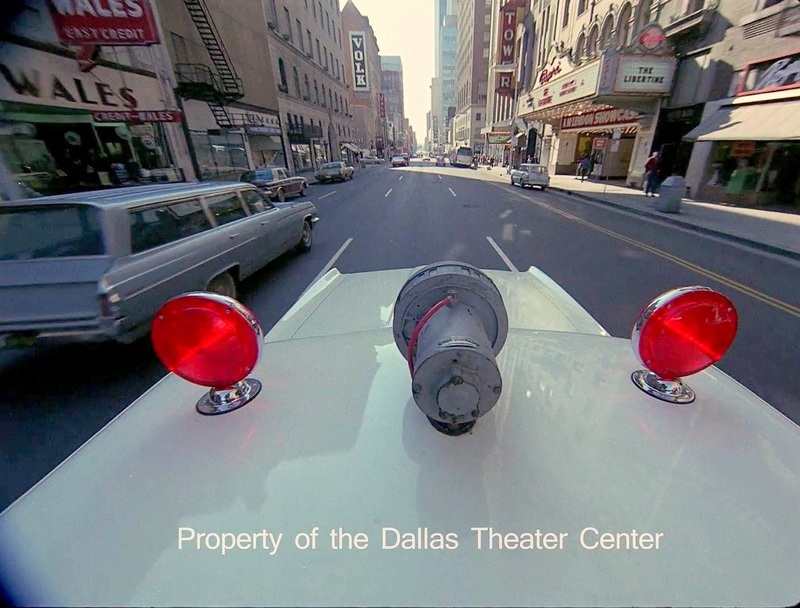 It is a 70's Soviet documentary on life in Dallas that devolves into JFK conspiracy stuff by the end. I saw and translated this when I worked at the Dallas Historical Society years ago, but had completely forgotten about it until it showed up on Soviet history twitter. Great footage of everything from Deep Ellum to the Fair to following Stanley Marcus around the flagship store. They also visit Houston and plenty of rural Texas, and add in some non-Texas footage of urban decay/segregation. If I can find it, I might post up a translation for those interested. I can't remember if it was the Herald or News, but one of the papers did a critical "review" of it at the time. The filming style is also very "socialist realist," but of course at the heart of one of the cities that defines American capitalism. It is sad to see videos like this that show how vibrant our downtown used to be before they decided to tear everything down and build 50 story fortresses surrounded by parking lots. At the time of this video, Dallas probably had half as many residents, but actually looked like a bigger and more vibrant city than it is today. I took Russian in college over 50 years ago and I could pick out a few words. The interviews of SMU Russian language students was interesting. The segment of H. L. Hunt is priceless. I would be interested in the translation if you find it. Just guessing, this may have been a film version of a cultural exchange program like the one US and Russia used to distribute monthly magazines in each other's country. The Russian magazine was called Soviet Life and out of curiosity my junior high aged cousin subscribed.....and the family got a visit from the FBI. Here is another video of Reunion Tower under construction. The general fireman used his CB radio to schedule workers and supplies. The height of the tower also led him talk to people across the country and around the world.